According to the National Standards Project 2015 report from the National Autism Center, one of the 14 established interventions for children with autism spectrum disorders is the use of cognitive behavioral interventions. I also mentioned this intervention in a previous post about the 14 evidence-based interventions for kids with ASD. The National Standards Project (2015) report states that cognitive behavioral treatment has been an established (evidence-based) treatment for individuals with anxiety disorders as well as depressive disorders for many years. According to the report, cognitive behavioral interventions are found to be an evidence-based treatment for children ages 6 through 14. However, it’s possible (and likely) that cognitive behavioral interventions are beneficial for individuals younger and older than that age range, as well. The report cannot claim that cognitive behavioral interventions are evidence-based interventiosn for younger and older individuals because there doesn’t appear to be enough research on those age groups with the use of cognitive behavioral interventions. With that said, there isn’t enough research on adolescents and adults with autism spectrum disorder in almost any treatment approach. This is a population which would benefit from further research to support effective, evidence-based treatments. Cognitive behavioral intervention packages have been created specifically for individuals with autism although there are packages that are made for specific concerns, as well, such as anger management (National Standards Project, 2015) or anxiety. Following is an example of how cognitive behavioral treatment can be used with children with autism. Educational Component: This is an aspect of intervention that would focus on teaching the child something related to the presenting concern, such as teaching them to label emotions, to identify statistics on how many kids experience a similar issue, to educate on coping skills, etc. Cognitive Restructuring: This is a component where the practitioner will help the individual change maladaptive beliefs that the individual holds. 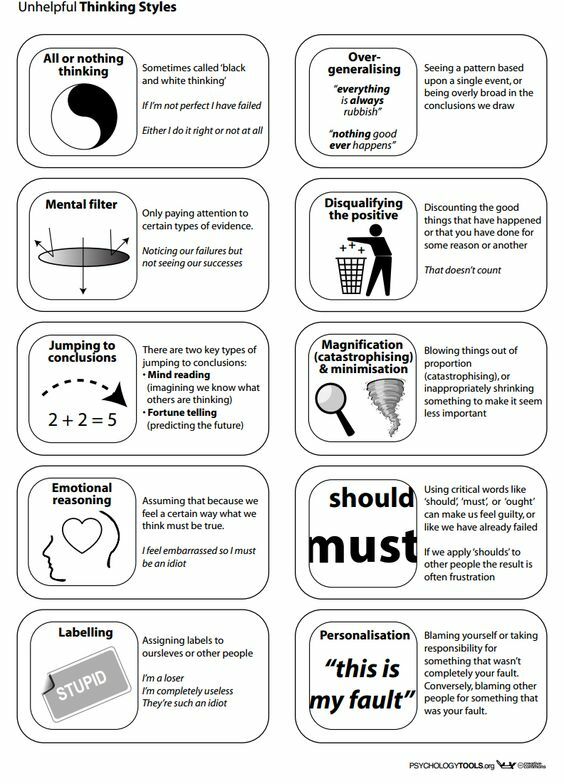 Following is an image of common problematic cognitive beliefs. Visual Supports: This is especially helpful for kids with autism who often have strong visual perception skills. 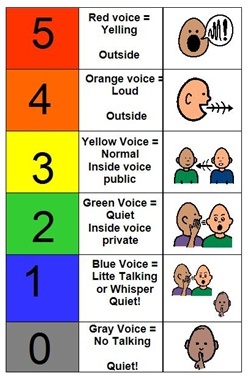 Using visual supports can be done in many ways including using a visual scale to rate severity of symptoms from 1 to 5. Following is an example of a visual support to help kids understand different levels of voice for different situations and another one for helping a child to figure out what to do while completing challenging academic work. Homework Assignments: It is common in cognitive behavioral interventions that the individual completes assignments to practice the concepts discussed in session. It is also beneficial to have the individual complete relevant data collection to go along with the homework. Parent training: As with many interventions for kids with autism, parent training is beneficial for kids with ASD because parents can help support the suggestions provided by the practitioner. Parents can help the child to find opportunities to practice skills and also help to reinforce attempts and appropriate behaviors when helpful. The National Autism Center suggests that cognitive behavioral interventions be provided by practictioners who have experience in both working with kids with autism spectrum disorders as well as experience and training in cognitive behavioral interventions. National Standards Project (2015). National Autism Center.